With all of the crazy weather going on I am finding new ways to make adventures from my spot on the couch. I have been reading some great books lately. I just finished reading this book today. It covers three time periods in history, the French Revolution, WW II and Present Day. This is a historical fiction centered around a legend of a beautiful castle in France. I have never been to Europe but this book certainly makes me want to take an adventure to explore some ancient ruins. What are your favorite genres or book titles? 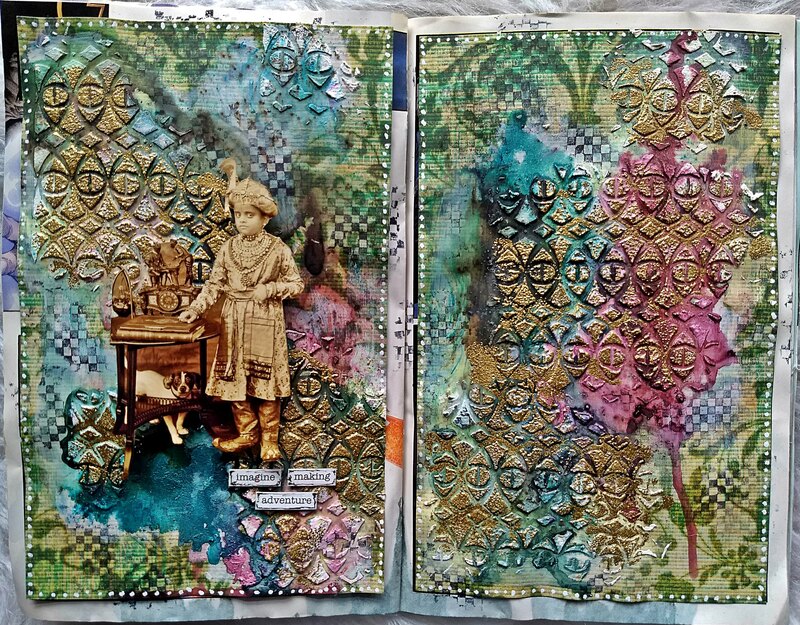 I had a lot of fun creating this page in my India themed art journal. This journal is all about backgrounds so I am using my favorite stencils. 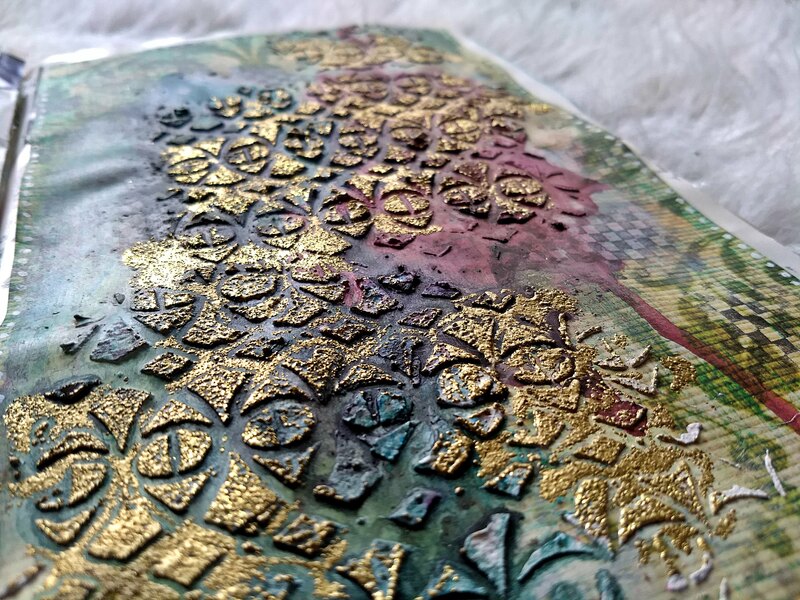 I used my StencilGirl Eye Lattice with texture paste and gold embossing along with PaperArtsy Infusions. The colors are so rich and vibrant. I used a Tim Holtz checker stamp as well. Another amazing spread Kate ! I could ‘study’ it for ages and admire every inch of it. Books are such good friends! Allende , Vargas Llosa, Marquez . And now I am in all things mindfulness – actually E.Tolle Audio books. Thank you Susi! I like audiobooks as well. I use them to pass the time while doing household chores. I will have to check out your suggestions! Have a great weekend. OMG, this page is AMAZING!!! I think it is my favourite so far, the colours are incredible, as are the textures and I just love the photo of that little girl! I love historical novels too, just lately I have been reading several Travey Chevalier novels. I am a visual person, therefore audio books don’t really do it for me, when I have tried in the past while on long journeys in the car, my mind always starts to wander. This book sounds very interesting, I shall check it out! Have a great weeked! Thank you for the suggestion Astrid. I am going to look up this author now. Have a great weekend. Oh my!! This spread is amazing Kate!! I love the vibrant colour and the textures are fabulous!! I love to read too!! My fave genre is fantasy! I love sword and sorcery tales but, at the moment, I am reading Outlander by Diana Gabaldon (which also has a sword and sorcery style element). Started by watching the series on Netflix and got so involved I had to get the books. I think there are at least 8 of them and so far I have six (reading is at No. 4) and am thoroughly enjoying the tale!! Two lovely pages, the structure and colours are amazing and I love the golden shimmer, subtle but there. Love reading too, I have read a lot of historic novels when I was younger, mostly about the Tudors. I like all kind of genres, but lately I am into the Inpector Lynley series written bij Elisabeth George. Have a nice weekend! Wow! Stunning Kate!! I just adore this textured background- you must know how much I love the tactile! Fabulous! I love your style . I think I might check out the book too. Totally my thing. I live in Ireland if you fancy a trip to Europe! Stunning texture and color! I love that image! Where did you get that? It’s perfect to describe your adventures from the sofa! 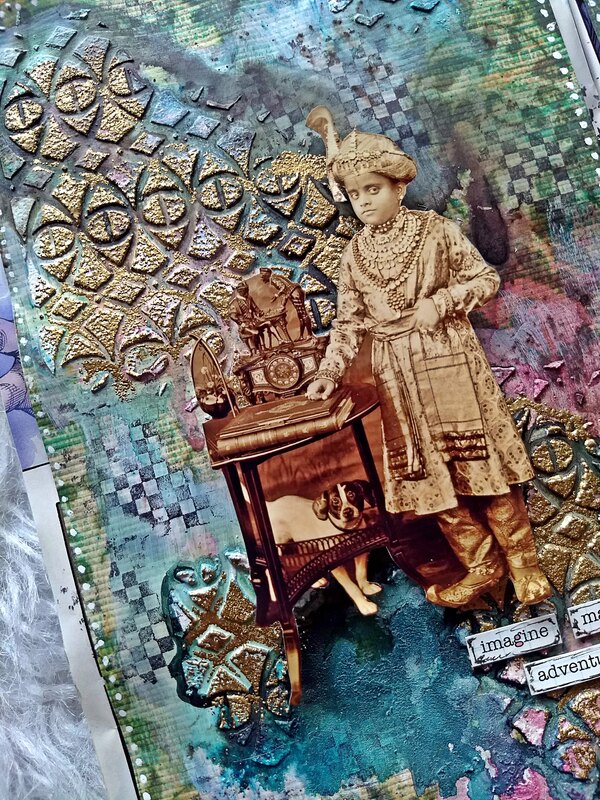 That gold embossing is so rich; I must remember to give that a try! As for reading, I’m not much for fiction, but current reads include Ayn Rand Atlas Shrugged (again!) and John Ortberg The Life You’ve Always Wanted. I read like I craft; slowly. Hugs! Beautiful work, some great journal inspiration too. Thank you for sharing this with us at Altered Eclectics. amazing colors and textures on the background Kate! another beautiful entry in your themed journal. Congratulations on your top pick at Love to Scrap! Yippee!